However, there are many sites out there that claim these benefits, and you’ll want to be sure that they are telling the truth. To help you make the right decision, here’s everything you need to know. You won’t find a set list of services on a dedicated page, but you can easily find out the list of services on offer using the drop-down menu on the homepage. Here, you’ll find a full list of assignment types that are covered, around 40 services in total. However, I couldn’t help but notice a few missing services that some students may be after, forcing them to go elsewhere already. The quality of Essayfactory.uk leaves a lot to be desired. There are no reviews or testimonials on the website which leads us to doubt the website’s credibility. Prices start ‘as low as £9.77’ per page, but this is actually quite expensive. 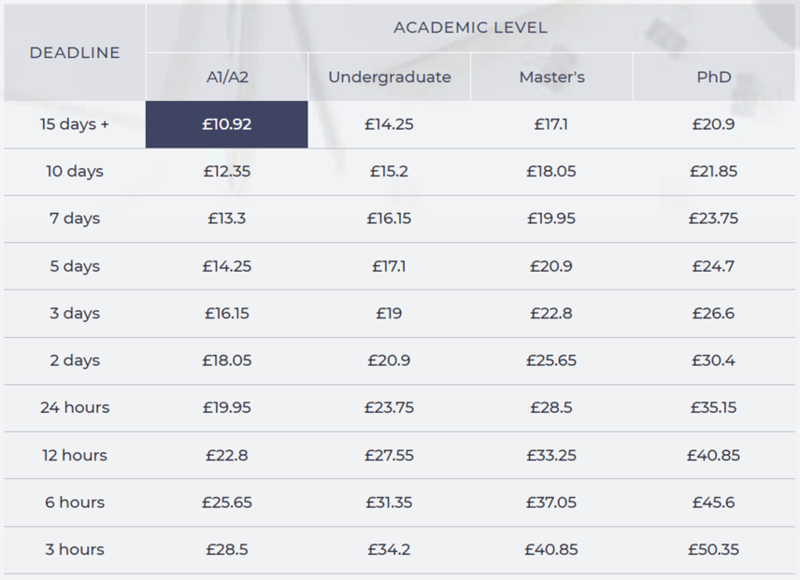 However, if you make your way to the pricing page, you can work out your actual quote using the pricing table. The price is worked out by type of assignment, the academic level required and preferred deadline, times by how many pages you want. For example, a ten-page essay, written to a Master’s degree with a 3-day deadline will set you back around £240. This is super expensive and not a price that many UK students will be able to afford. Many students will also want to look into finding a regular service, so they can get discounts, but it doesn’t seem this is something the site offers. If you make your way over to the contact page, you’ll find a small collection of methods you can use to contact the company should you have an enquiry or question. The website claims to be available 24/7 with a phone number, live chat system as well as an international phone number and support email address. However, the live chat only operates during set hours of the week, and there’s no email form, Skype contact name or social media profile links, something most of the leading custom essay writing services have. All in all, EssayFactory leaves a lot to be desired. 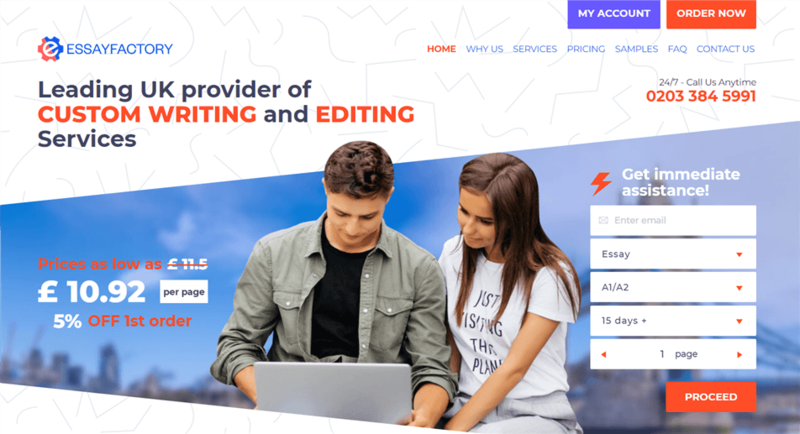 The foundations are there for a decent custom essay writing service, but the inconsistency in the quality and the high prices mean that we would have to recommend using another leading website.